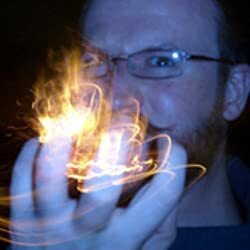 Robert Brockway is a columnist and Sr. Editor for Cracked.com. He lives in Portland, Oregon with his wife, Meagan, and their two dogs, Detectives Martin Riggs and Roger Murtaugh. He once fought a bear, but the judges are still calculating scores; there is no clear winner at this time. CLICK HERE FOR MORE TITLES BY ROBERT BROCKWAY. Today Fantasy Literature welcomes Robert Brockway, currently celebrating the recent release of The Empty Ones, the second instalment in his horror-comedy-punk VICIOUS CIRCUIT trilogy. Mr. Brockway made time to chat with Marion Deeds and Jana Nyman about his wide-ranging influences, his reading preferences, and how he makes unlikeable characters interesting. One random commenter with either a U.S. or Canada mailing address will win one copy each of The Unnoticeables and The Empty Ones. 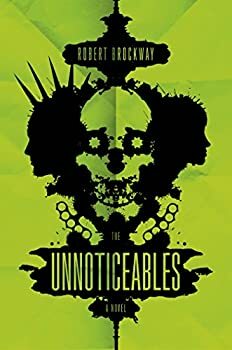 There was a lot I liked in Robert Brockway’s urban fantasy novel The Unnoticeables. Starting with the most superficial elements first, I loved this cover. Tor went ironic, giving The Unnoticeables a highly noticeable cover. It’s venom green, a mashup of gearwheel-eyed killer clowns, fractals, figure-ground images and spiky-Mohawked punks. It’s disturbing and kind of funny, thus the perfect cover for Brockways’s novel. The Unnoticeables is the first in a series. The Empty Ones (2016) is suspenseful, scary, action-packed and occasionally gross. This is the second book in Robert Brockway’s THE VICIOUS CIRCUIT series, following 2015’s The Unnoticeables. The Empty Ones crackles with tension, and I found that several of the questions that plagued me at the end of Book One are answered here. By the end of this one, I am even more worried about young stuntwoman Kaitlyn than I was before. Space whales. Inter-dimensional parasites. A Hollywood stuntwoman who exploded an angel and now must do something even harder and greater. An aging punk who would rather die than stop fighting. 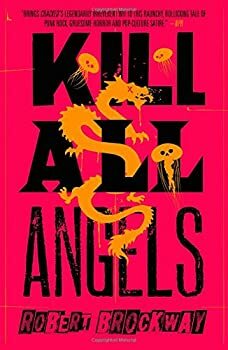 All of this and much more await readers in Kill All Angels (2017), the final volume in Robert Brockway’s VICIOUS CIRCUIT trilogy. As is to be expected, the books need to be read in order, beginning with The Unnoticeables and continuing on to The Empty Ones before getting here. Spoilers for the previous books will be difficult to avoid, but will be kept light.